Somewhere in the multiverse is a being. An Observer. He watches on as an eccentric man and his colleagues pit many combatants against each other in a fight to the death. As he watches, he appreciates the idea. However, as he watches, one thing goes through his head. 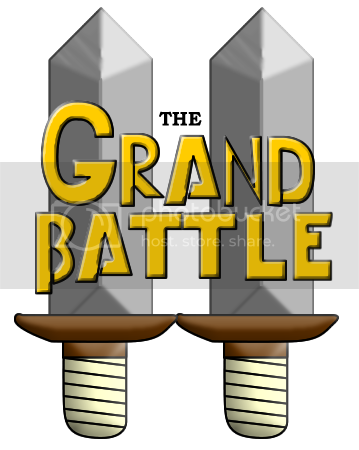 Yes, because the first Grand Battle is going to be a while before it ends, and some people have expressed interest in trying, but weren't able to due to the other one being ongoing, I've decided to get another one going at the same time! Here's a link to the original one. The rules are for the most part, unchanged. A few things I need to reiterate, though. Your character has no idea about this battle! In your character's bio, no writing about how they were approached and offered the chance to be in. Basically what happened is they were plucked from their world (possibly at an inopportune time) and put into this tournament completely unceremoniously. One minute they're doing whatever, and the next they're gone. In round one of the original thread, almost-there was eliminated due to posting so very little. The next round, fait forfeited simply due to lack of interest. You still are allowed to forfeit and lose automatically in a round, but still try to be around to continue roleplaying until your death. There wasn't a problem with this before, but it's a good thing to state anyway. Use an original character, instead of just ripping somebody from an outside source. It is okay to recycle a character that you've used before, as long as it's still your own creation, but it's more encouraged to come up with something new. Also, your character can be pretty much whatever you want! Do they come from a sci-fi setting? Sure. Were they pulled from the wild west? Okay. Is their origin in a world of cartoonish physics? Go for it! Your characters are from all over the multiverse, so have fun. Elimination is decided based on writing skill. This involves characterization, your prose, and grammar/spelling as well. If you feel that other people are writing better than you, then learn to write better! Lack of writing skill doesn't discount you from joining, it just means that when playing you can use it as an excuse to get better. It's not bad to start with short posts at the beginning. You can use about half of the first round to get to know the other characters and learn what they're like before jumping straight into hoping you've got their personality right. As it goes on, you should learn more about everybody's characters, though, and then your posts will get longer. Okay, I think that's good. Here's the form! Username: Um... your username. I suppose it's to the left of your post, but... shut up! Name: Your character! No self insertion, jerk. Gender: Male, Female, or N/A, really. Race: Species. Human, cyborg, elf, anything else you can come up with at all just about. Colour: You're going to be posting your story sections in a specific colour so your posts are more easily identifiable. #008040 is not available. Weapon: Does your character fight with something? Mention it here. Abilities: What makes your character so special that they were chosen for this? Description: Physical and personal. What do they look like and how do they act? Draw a picture to help show what they look like, if you want. Biography: Finally, their backstory. Character depth and all that. Any questions can be directed to The Observer. I was actually thinking of hosting one of these myself once the original ends. Whenever that is. Anyways, I'll be keeping an eye on this topic. It'll be interesting to see how it develops differently. Originally posted on MSPA by Opirian. Weapon: Carbon steel combat knife, rechargeable plasma pistol, plasma rifle, Magnetic/Hooked Grapnel. Abilities: Urisian heritage provides immunity to most diseases and poisons, any sickness is also quickly recovered from. Colony training has provided above average muscle and bone strength. Description: A young hotshot pilot back in his world he was fairly resourceful solving problems with what he had. After an accident that almost took his life he became a bit more cautious but still adventurous. He's always had a knack for sensing danger. Galus stands just under 6 feet tall and weighs around 130 pounds, he has dark brown hair and scraggly beard. His orange eyes denounce his Urisian heritage. He constantly wears his blue and black specialized for him space suit and helmet. Biography: Galus has lived on the colony ship Ceres his whole life. As a teenager after the mysterious loss of his parents during a scouting mission he began to work until he was able to purchase his own corvette. After the purchase he became a freelance pilot and guard taking any job the colony gave as well as providing security in areas the Ceres military couldn't always watch. After the attack on Ceres by Krowe, Galus traveled far and wide to explore the mysteries of the universe, what he found is a story for another time. Originally posted on MSPA by bobthepen. Description: Samuel is well dressed and groomed. He's clearly accustomed to living a lifestyle of luxury. He has a charming accent and appears easily likable at first glance. However, all of this is a facade. His ability has created within him an unnatural lust for power and a megalomaniacal self view. He has learned patience, however, and is quite calculating with how he uses his ability. Biography: Many, many years ago, Samuel discovered his Karmic powers. At that time he was simply a normal man, subjected to cruel experiments by those who wished to know more about the nature of Karmic Humans. It was there, surrounded by the death and decay of the discarded corpses of failed experiments that Samuel first sensed power emanating from their mangled flesh. He managed to escape, and over time he grew accustomed to the intoxicating scent of death. He learned from experience, that by cutting off the life of someone young, who Karma had destined to live to a healthy old age, he could direct that loosed Karma, their youth, into himself, thereby prolonging his life and his health for ages. Presently Samuel enjoys a comfortable life behind the scenes. He has used his abilities, coupled with his experience and longevity to shape the formation of a puppet state which dictates the lives of countless citizens. He has wealth, comfort, and power on a global scale...and yet, he desires something more. I'm assuming we can't take part in both, then. Originally posted on MSPA by PawntoD4. Would I be able to join since my other character is dead? I'll probably just watch, but I like to know if I have the option. Yeah, since you're already dead in the other one, you do have the option of participating in this one. Okay thanks. I'll only join if you don't get enough others though. OOC:I want to join but I can't think of a charactor. [img]images/smilies/icon_sadder.gif[/img] I'll put what I think of in here though. Abilities: Capable of matierialising random objects (not many weapons though) and wielding them proficently, however the exact object and it's usefulness will vary (I.E a baguette when something like a...bludgeon of somesort would be more useful), he's, strangley, useless with regular weapons (he can easily fence with a bowling pin or the aforementioned baguette, but give him an actual fencing weapon and he'll likely end up poking himself). Description[img]images/smilies/icon_surprised.gif[/img]ne of those shirts that look like two worn at the same time but not, grey and dark blue for the main shirt + short sleeve bit and long sleeve bit respectively, blue cargo trousers and a full face mask with a :3 face painted on it. Biography: Ok, there was this guy see who was a stage magician by trade, a conjuror to be specific, but lost everything except his talents when he found a blank, white, mask to wear for his act. Although the mask increased his talent well beyond any mortal limit, he became unable to control his talent and spent years practising to get his control of it to point it is today.and the :3 face? he painted it on so he wouldn't scare his audience while performing. Weapon: He's a dab hand with a rapier, which he always carries, but if he can get his hands on one he has more than reasonable prowess with a gun as well. Abilities: A sound thinker with a brain geared for analysis, he can put his grey cells to his advantage in what ever life throws at him, not to mention a calm mind in battle. Description: A little too tall and thin to be comfortable, with short, well kept, auburn hair nearly always hidden under a hat of any kind available, and some slight stubble. He's almost always in a greatcoat, but one never quite can fathom whether he hides behind it for his safety or theirs. Personality wise, to put things bluntly, he's an introvert that's gone a little too far round the bend. With a tendency to be cold and over-logical, he habitually overthinks things, yet doesn't get all angry when wrong - such actions haven't done anything good to him over the years. He's usually fairly silent, though he mutters to himself occasionally and has been known to finish other people's lines of thought for them. That doesn't mean he can't communicate, though, and he can be rather difficult to shut up if he finds he's expressing himself better verbally. Biography: Hailed as a gifted child from a remarkably early age, the pressure put on Maxwell to succeed made him shun society as a whole and forced him to move to live with a sympathetic uncle in the countryside, where he picked up fencing and shooting not just to pass the time, but also to express his emotions. He earns his living by doing to odd mental task around the village, but is generally left alone and lives a fairly secluded life. Originally posted on MSPA by Draykon. I'm not crazy enough to try and do two at once, but I'll go ahead and keep watching this topic. Interestingly I noticed most characters in 1 had some kind of magical/fantasy background. It'd be interesting if there were more Scifi-ey characters here. I would like to join, give me some time to type it out. Weapon: The Cane of Materialistic Probability, it can change the composition or mass of any object. Abilities: He is a scientist that made the Cane of Materialistic Probability, and the only one who can wield it. that's pretty much it. Description:A Well built 1890's scientist with a top hat and a fancy suit. A little eccentric, but not too crazy. has one of those Snidely whiplash mustaches. Biography: once a normal scientist who was one day visited by Lord Reginald Quickington. The speedster helped The professor break the Materialistic barrier, enabling him to create The Cane of Materialistic Probability. Lol at the probably unintentional clone of my character. If this is a secondary battle that takes place at the same time as the first, perhaps there can be a sort of crossover some time. Draykon Wrote: I'm not crazy enough to try and do two at once, but I'll go ahead and keep watching this topic. Hm... I'll consider it. We'll see where it goes. You guys need to really do more writing, by the way! I have to actually scroll down to find the first one! Hop to it! You're in, but your character is pretty powerful. Try not to abuse it, and you can survive. I figure I might as well try even though I can't write for beans. Race: Schrotgolem: Nobody's quite sure what causes schrotgolems to form; mages can't seem to make them intentionally, nor can they stop them from coming into being. A schrotgolem appears to be a low-level spirit of sorts that inhabits a number of different small objects at once; one might be a candlestick, a pair of shoes, a doll, and a box of tissues one moment, and a completely different collection of scrap the next. Abilities: Gestalt is unusual in that he is more self-aware than the average schrotgolem and can inhabit many more objects at once than most. Description: It would be pointless to describe Gestalt physically. Its personality is best described as cautious; it likes to be sure about what's going on around it and who it can trust before revealing itself. It tends towards stealth and discretion, which is easy for something that is a collection of disconnected objects. Biography: Gestalt appeared a few years ago in a large city, near a magical school, as is typical for its kind. Since schrotgolems don't have 'needs' in the conventional sense, most tend to just wander, watching. Some eventually get bored and become erratic; some kill indiscriminately to fill the time, others spend years creating and destroying bizarre art, others still just stop doing anything at all. Gestalt followed the typical patterns for the first couple years, wandering the world and seeing things, but never progressed to the erratic stage; it is more paranoid than others, though, and tends to see things as threats that most wouldn't, and it has no compunctions about eliminating things it sees as threatening. Weapon: Vyrm'n can replicate living things, so he can make teeth and claws and stuff. Abilities: Senseless - Can not feel pain, or many other emotions, for that matter. Senses sharpened to an almost atomic level. Oh and it can fly through air like an eel swimming, and change its form at will. Description: Faceless, when still, resemble a huge pillar which resembles a semi-fluid, but is solid and like polished marble to the touch. It is as black as the void, speckled intermittently with pinpricks of light which swirl across it, making it look like a starscape. They can form freely into the shape of their "host", and can freely grow arms or faces as needed if their host had them. In flight, their shapes are stretched out and streamlined so they resemble comets. Faceless' outsides are hard to pierce, but contact with any matter hurts them to some extent. Vyrm'n in pillar-form is about 8 feet tall and four feet thick. This gives some idea of his mass, which dictates how big his transformations are. Of course, all his transformations are still made of the same matter he is, and come out shiny, black, and specked with stars. Faceless in their natural state care little about the affairs of the universe; only when finding a host do they take on that host's emotions and any sort of personality. Vyrm'n's host was a prototype humanoid Tleilaxu which had been programmed to take pleasure from killing; so Vyrm'n does so as well. Biography: Vyrm'n, like other Faceless, normally dwell at the edge of the universe, revelling in each other's company as they rush into the void to avoid the sting of matter contained within the universe. Once in a while, a Faceless may be left behind in this rush and left to wander the universe alone. This happened to Vyrm'n, who was picked up by a researcher and made to steal the Tleilaxu's being, granting Vyrm'n an encyclopediac knowledge base and a personality that only found happiness in violence. Unlike most other Faceless, Vyrm'n also has knowledge of Faceless in general (as they normally lose this in the process of taking from their host) as discovered by the researcher, giving it a dangerous self-awareness and prowess with using itself in a fight. This self-awareness allows him to take in the forms of those he has killed, and transform into them. Uh, I'm waiting for Amethyst/Eximo to continue their chat for a few more moments, so I can jump into the conversation. Either Sruixan or SleepingOrange will have to change their colour. I should have specified everybody needs a different colour. Sorry. ...wow that's a lot of blues in general. It's no big deal, just as long as no two people have the same shade of blue. Originally posted on MSPA by DimJim. Archduke_Ferdinand Wrote: Can I reserve a spot? Current time: 04-26-2019, 04:12 AM Powered By MyBB, © 2002-2019 MyBB Group.